To greet the new year, here is a fanart of Nagi and Hayate together. It's a tribute to Kimi no Na Wa. 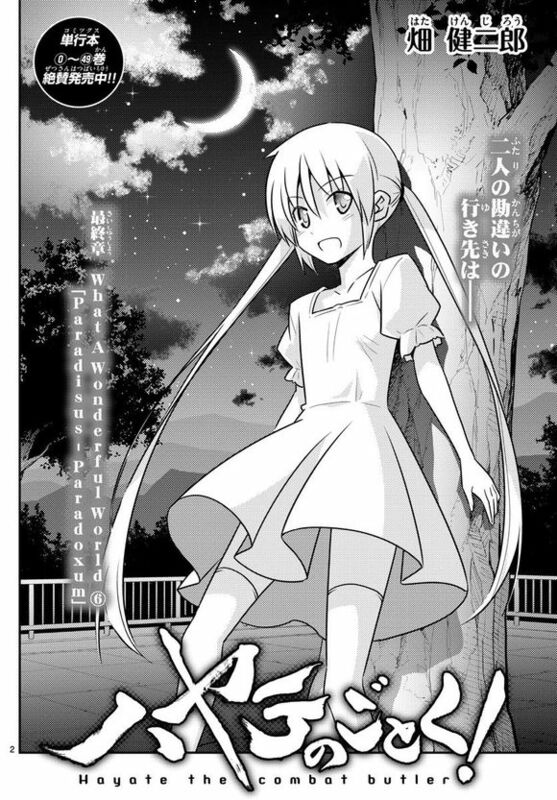 I chose a nighttime background because Hayate and Nagi met at night after all. The intertwining shooting stars represent their respective character development progress so far -- Hayate has a lot of catching up to do. Enjoy this manga while you can guys. This is most likely the last year for it. Also, can we stop hating on Nagi -- please? There are still people like me who like her as a character and who want her to be with Hayate after all. If your ship has been sunk, don't wish ill on others. Anyway, below this post are some more new year's pics. 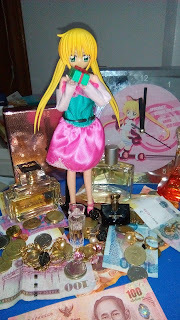 Also, I'll have changed the blog's background by the time I've uploaded this post. Anyway, even if the manga ends this year, I'll still write stuff and draw fanart of Nagi for as long as I am able to. So to make things a bit interesting, I'd like to learn more about the active readers/commenters on my blog. What got you interested in the manga? 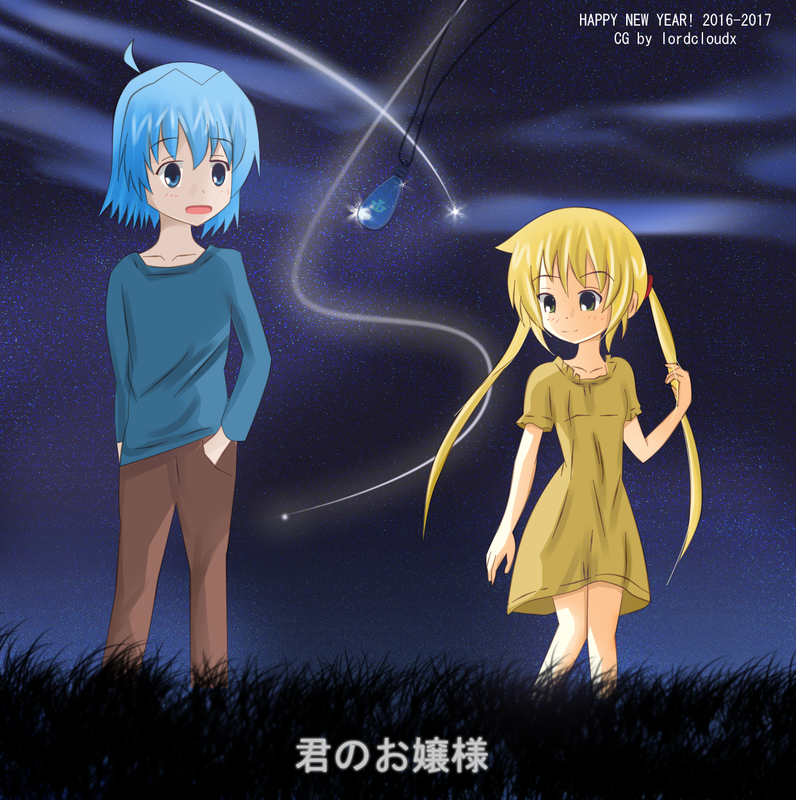 (Hayate no Gotoku!, of course) How are you celebrating the new year? Do you buy merchandise of your favorite characters as well? Let's talk! Hope to hear from you in the comments! Something extra for 2017. This is Nagi's limited edition heat-reveal card from Vol. 48 of the manga. I uncensored it myself. ENJOY! What an extremely fitting chapter cover to end the year~ so beautiful mai waifu! Chiharu: That girl... really loves you, Ayasaki! Chiharu: It's true love. She's already dreaming about marriage. Chiharu: In spite of this... in spite of this! Chiharu: You have no feelings for her!! 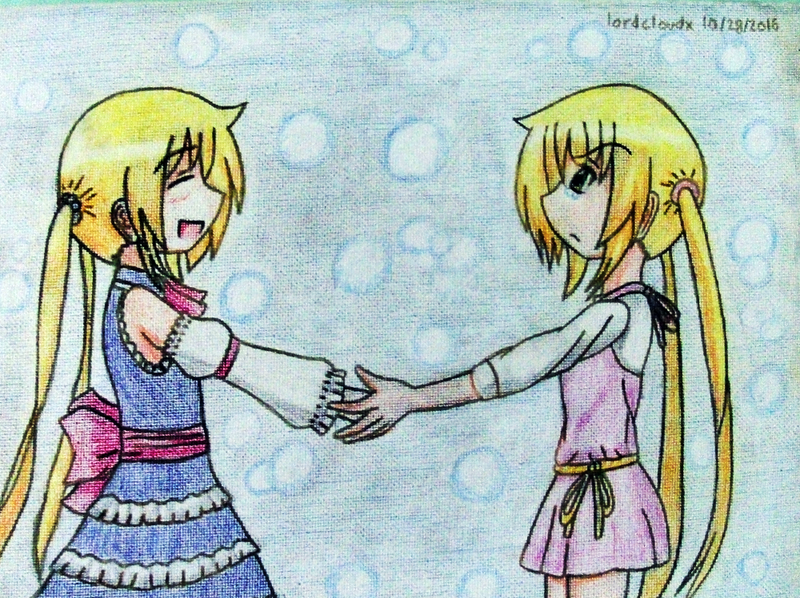 Hayate: Our relationship didn't matter... it was kindness. Chiharu: Maybe you misunderstood each other... I don't know. Hayate: Please don't tell ojou-sama about this. Chiharu: Be silent? To keep fooling her? Hayate: Can we talk for a bit? Maria: Well? What did you wanna talk about? Hayate: It's a bit hard to say but... could you not quit being a maid? 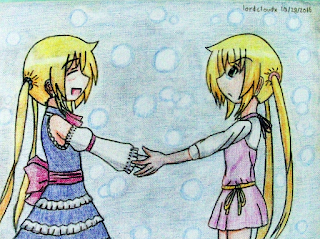 Maria: Hayate-kun, when I'm gone, you won't be alone, right? Maria: On that night of Christmas, Nagi misunderstood that you confessed to her. I know. Maria: Of course, there's no way that I would not have noticed the two of you at this point. Maria: "I can't respond to Nagi's feelings, but also, I can't leave her alone." Maria: "That's why I will defeat Hisui." Maria: "I will win the Sanzenin Inheritance for her and then leave." Maria: "But then ojou-sama will be all alone. That's why I want Maria to stay by her side." Maria: That's what you're thinking, right? Nagi: What's going on here? Nagi: W-what? What's with that loud voice. Nagi: Oh hai guyz. wazzup? Nagi: Well? What were you talking about? Hayate: Eh? Well, it's not really anything important. Hayate: Just talking about tomorrow's meal plans. Maria: That's not what we were talking about. Hayate: Nah, it's not really anything important. Maria: Nope, it's really something very important. Maria: I've been thinking about quitting being a maid. Maria: I've been talking about it with Hayate. You no longer need a substitute mother. Maria: That's why near your 14th birthday. I'm thinking about quitting. Chiharu: Yes? Who is it for? Guy: Well, I'm from a neighborhood redevelopment company. 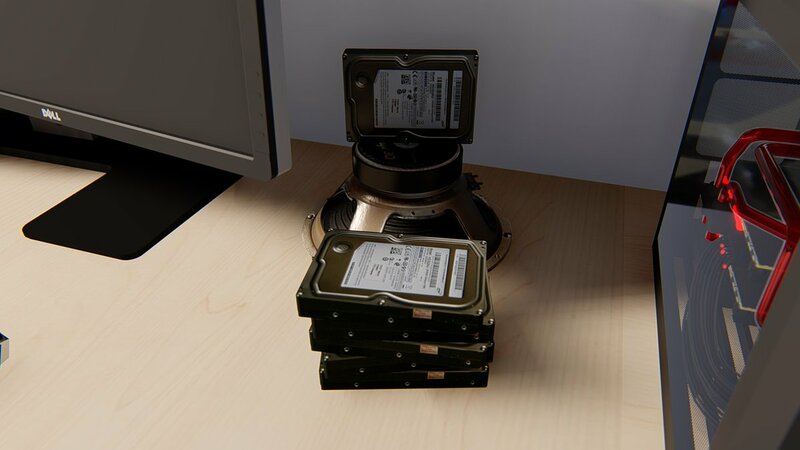 I just have a few questions. Guy: This apartment was planned for demolition at any time, wasn't it? Review: Awesome chapter, this was! Both Maria and Chiharu really shined. 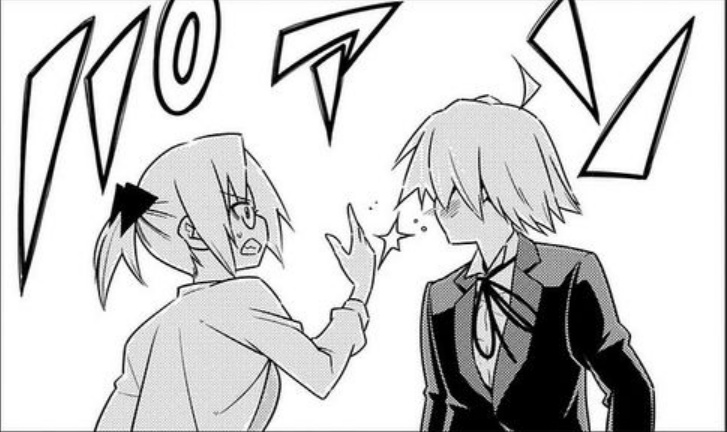 I'm still a bit frustrated that all Hayate could do was show that sad pathetic face of his for the entire chapter... but still, he now has plenty of room for character development. Also, that slap from Chiharu was brilliant -- he's had it coming for a long time. Yeah, yeah, we all know the misunderstanding is because he's dense, but that is not an excuse to allow things to escalate to this level. He should have known better and reflected on his actions earlier. Nagi gave him all the signs after all -- but nah, he chose to ignore said signs -- even her manga and pretend that all was well and good. Nagi has delicate ears. 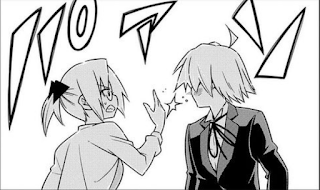 Don't you shout at her like that, butler! In short, Ayasaki was being a coward and now he's being made to face the full consequences of his actions. I like how it was both Chiharu and Maria who did it. Maria wouldn't allow him to take the coward's, convenient way out. 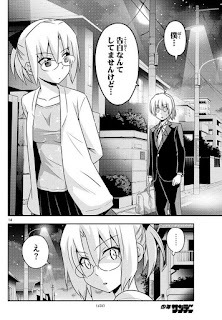 Anyway, the bomb is still looming over the horizon, but more importantly, it's about time for Hayate to seriously start thinking about Nagi now that he really knows for sure about her feelings. 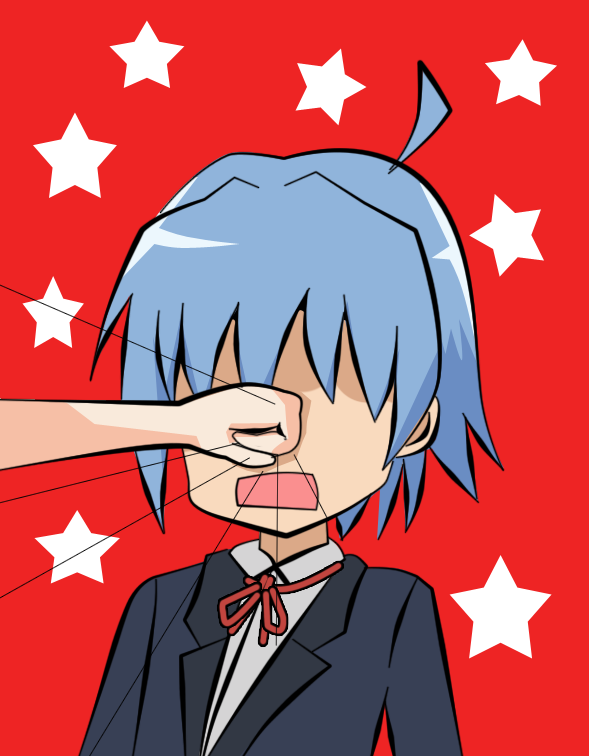 That slap from Chiharu was a good wake-up call for him. He had it coming... even my fanart says so. Chiharu's character was portrayed really nicely here. Frankly, I never liked her and her high-handed attitude in the mangaka saga, but now she's shown that she's a true friend to Nagi. She knew just how much Nagi loves Hayate so she was actually trembling with anger over what Hayate said about the misunderstanding. 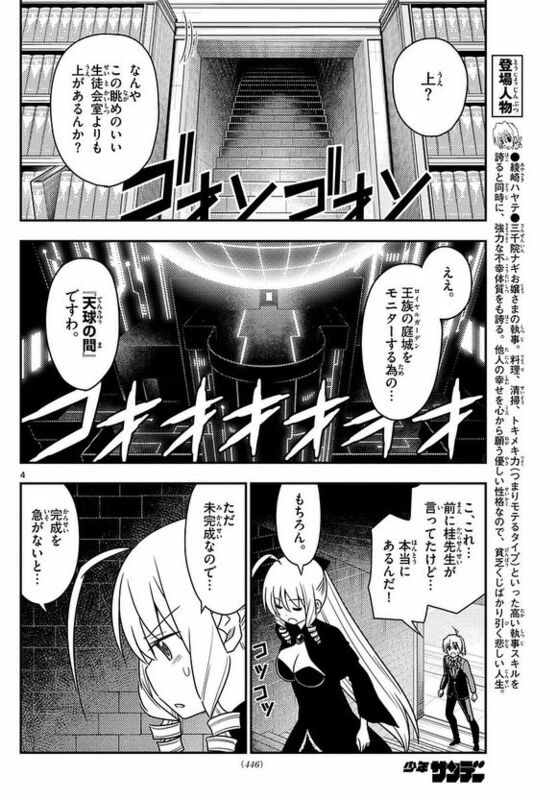 I also loved how Maria kept contradicting Hayate. He needed that -- a lot. Let's see how it goes from here~ see ya soon! Merry Christmas, everyone! I've prepared a party for two with mai waifu today. I'm still working on that new year's fanart, but I have prepared one fanart in anticipation of certain "bombs" going off. The song is "White Gift" sung by Hatsune Miku. I have no idea who produced/composed it. A-tan: Even if the stone is in the enemy's hands. For the royal garden especially, knowledge about the king's jewels. This should be top priority. The enemy does not know how to open the path. In order to use the path, you must enter this place -- basically. This place is a fort. You must use this the moment you try to enter the castle. I seriously want to punch Hayate's pretty, girly face everytime he wears that expression. Hayate: I see, then... let's prepare some weapons and ammunition to intercept them! Sakuya: What kind of preparation is that? 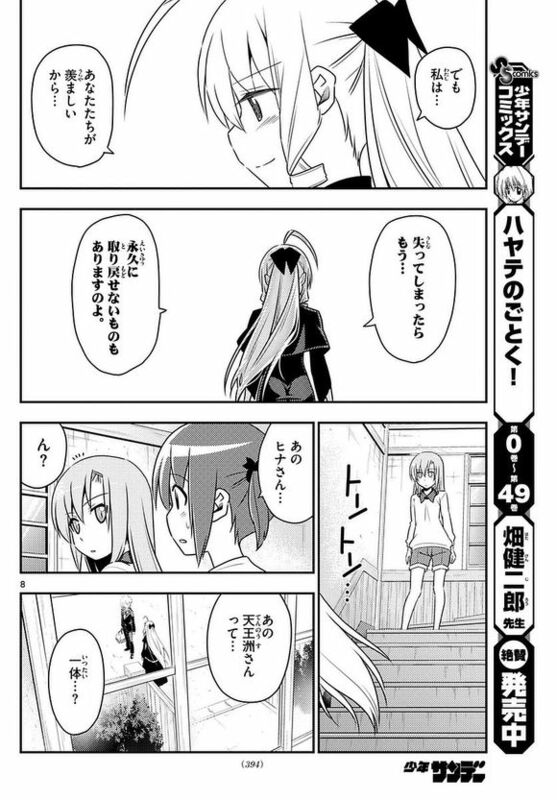 Hayate: Dun worry, I once prepared with an MG 42. Other than nuclear weapons, I can bring it from the Yakuza's warehouse. Sakuya: Did you bring it all the way from the 4th volume? Sakuya: Anywayz, it's good to be prepared but... what do you really need from this place? A-tan: Well, over this place, there is something I need to use. Sakuya: Whut the fudge? This is a pretty amazing sight. There was something on top of the student council building all along? A-tan: yeeeeees, I can monitor the royal garden from here. Hayate: This... Katsura sensei talked about this before, so it was true. 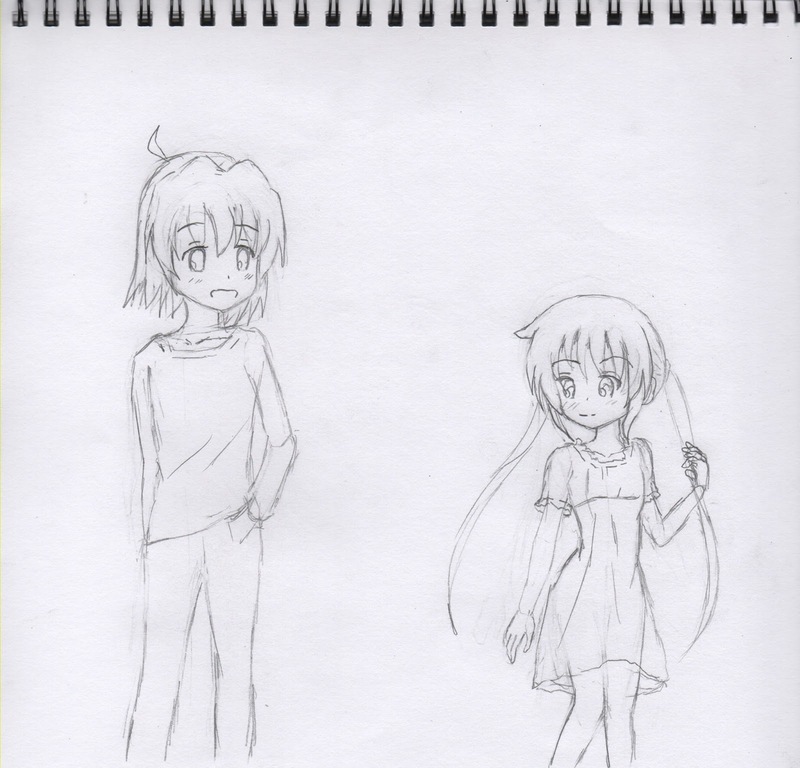 A-tan: It's still unfinished, but we're in a hurry. A-tan: Anyway, Isumi and I will stay here. 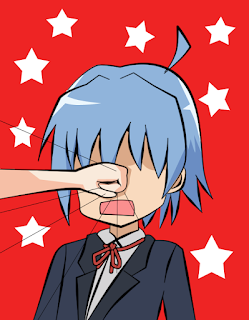 A-tan: Hayate, you eat up and get some rest in preparation. 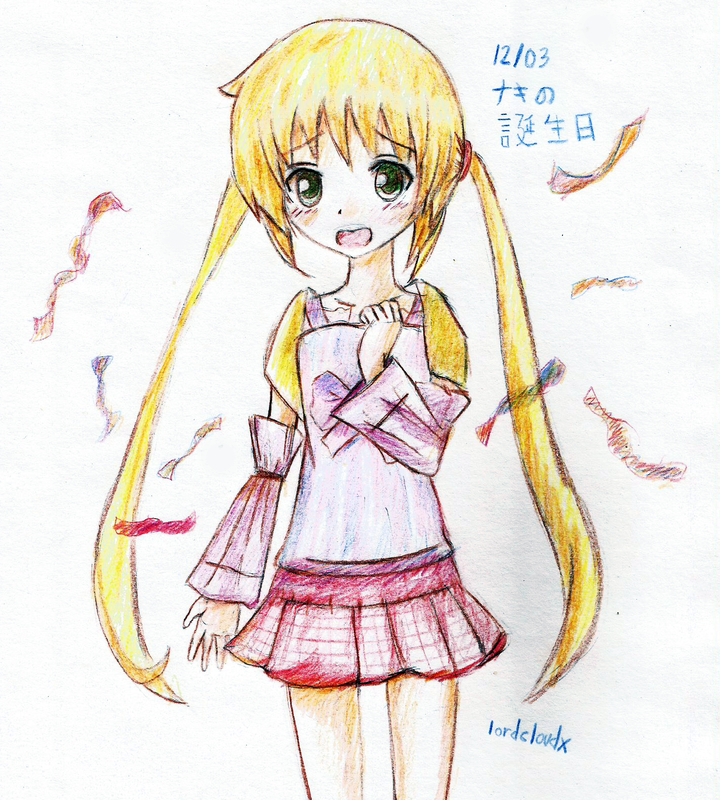 Nagi: Oh, Hayate! Welcome back! Nagi: You seem to be in a hurry. Hayate: It's for ojou-sama's future, so I must do my best. 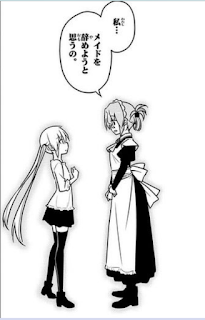 Hayate: How is your manga coming along, ojou-sama? Nagi: The manuscript is there. I'll be able to submit it soon. 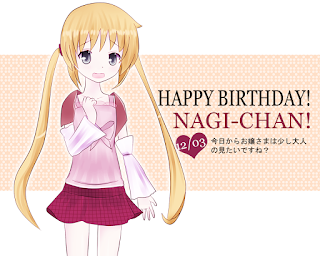 Nagi: Maybe I could buy Hayate's birthday present with the prize money for winning the manga contest. 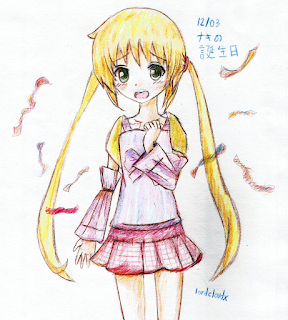 Hayate's birthday is on November 11, right? Hayate: A-anyway, I have some errands to do. Sakuya; By the way, what's Himegami up to? Sakuya: I mean, he suddenly quit being Nagi's butler and now he's Hisui's butler. Sakuya: He was also on good terms with you. He's really changed. Isumi's grandmother: Watcha talkin about? Isumi: We're talkin about Himegami. Ya remember? Nagi's former butler. Great Grandma: That kid who got cursed. Chiharu: Well then, that's it for me. Hayate: Ah, Chiharu-san, you're going home? Chiharu: Yeah, I think I want to sleep in my own room today. 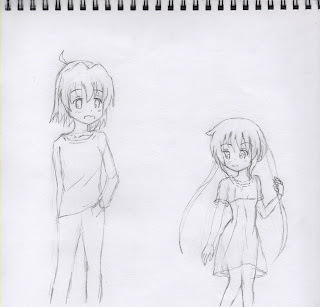 Hayate: Then I'll send you off to the apartment. I'll be going to Hakuo anyway. Chiharu: But seriously, you're really trying your best for Nagi, huh? Chiharu: Haha, that's what friends are for. Chiharu: I've also been a bit inspired lately to write a light novel. Chiharu: I think the trend right now is traveling to a different world and becoming a butler, don't you think? Chiharu: But I heard from Nagi. About your first meeting. It was a nice story. Chiharu: That Christmas eve when you confessed to Nagi. Chiharu: Oh, sorry, was it a secret? But, I haven't told anyone. Chiharu: It was a really nice story to hear. Chiharu: Falling in love is really nice, I think. Chiharu: It was a fated meeting, wasn't it? Chiharu: I want you... was it? Chiharu: Ayasaki, you really don't look the part, don't cha? Chiharu: Incidentally, what part of Nagi did you like? Review: Ok, let's just turn this into a review while my connection is stable. Whoo! What a chapter eh? I for one am glad that Hata is taking the direct approach here. 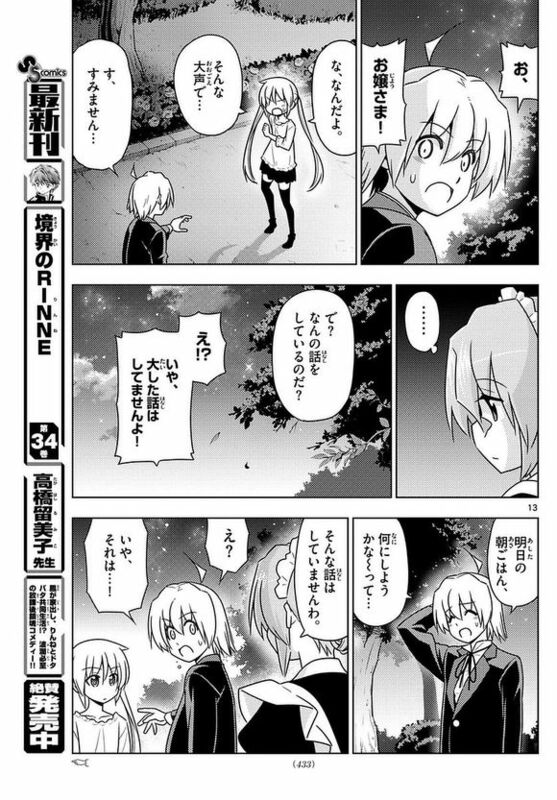 He's finally removed all the safety nets on the relationship between Hayate and Nagi. How things go from here will determine the FUTURE! I think it's a good thing that this is happening before the final, final battle with Hisui and company. Hayate's been fighting for Nagi for all the wrong reasons all this time. Now the misunderstanding has finally come to light and it can be addressed. How about this, though? What if he tries to tell her and then he looks at her... he feels something... "wait... why... why can't I do it? Why can't I tell her that I never confessed?" Hoh, that would also be awesome. Personally, I have no preferences as to what should happen -- I'm fully confident it goes favorably for my ship either way. However things go from here, it's gonna be a rocky, tearful and absolutely thrilling ride - so don't take your eyes off of ths manga for a second! Ok, for the boring stuff... yeah, we got that hint about Himegami from Isumi's grandmother which I dun really care about. Also, hurray for you, King's Jewel's fanatics -- another one of your old theories proven right. Hakuo is indeed connected to the Royal Garden... and stuff. Anywayz, this is exciting but we have a one week break, see ya next week (for my Nagi Christmas post that is) and dun forget to let me know your thoughts in the comments! Fanart Corner: This is for my new year's piece. I plan to make a digital version with more interesting effects. Incidentally, Kimi No Na Wa is being aired in Philippine Theaters today. Go watch it! Synopsis: Well, I guess this is going to be my new setup now isn't it? Go here for the long version. Athena has a little chat with the girls from the Violet mansion -- specifically the ones in love with Hayate. 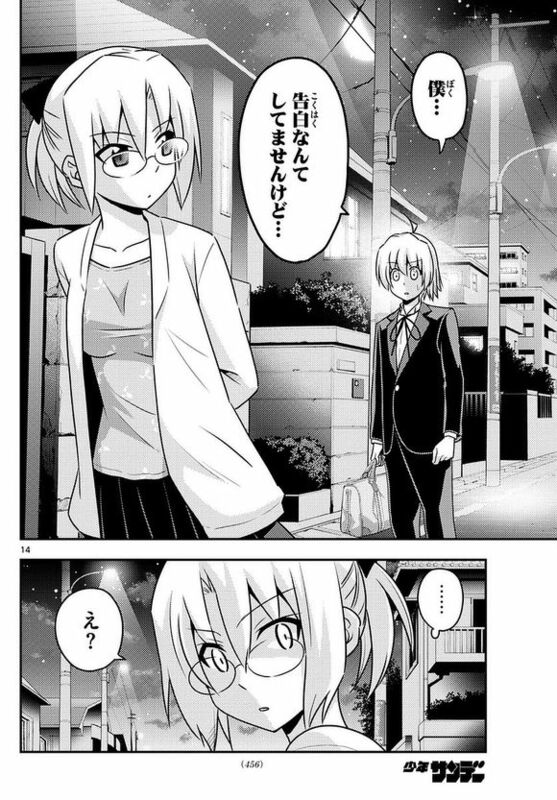 In the end, she chats with Ayumu who declares that she loves Hayate the most. 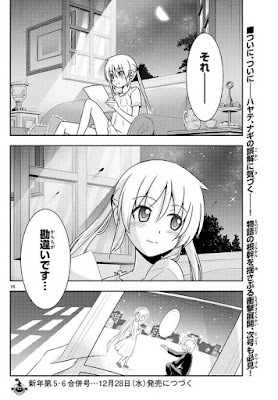 Athena does not disagree with her and simply says that she hopes everyone can meet up again when they're adults as good old friends and that Hayate will be there with them so they can have a fun chat about an interesting love story. Review: I had planned a longer more biting discussion, but after a brief chat with Doughnut Gunso via twitter, I've changed my mind. So thanks for that little reminder, sarge. Ok, so basically, the setup of this chapter is Athena saying an ambiguous farewell. While the implications seem very clear to me, I shall respect anyone's protests that it's not what it looks like. At this point, I have to wonder if Hata is up to his ears in death threats yet. Anyway, I liked this chapter a lot. The development came from out of nowhere, but it was done with the grace befitting of Athena. It also shows us a little bit of a selfish side to Ayumu (if I read that correctly, that is) in declaring that her love for Hayate is the strongest... although on that point, I must protest because that honor obviously belongs to mai waifu. Still, you cannot fault Hamster for her devotion -- if anything else. There was a real air of nostalgia in Athena all throughout this chapter. As for Hina, Athena gave her a little bit of an extra push with her teasing. She also heard Ayumu's declaration, so let's see what she does with it. Mai waifu was not present here, but it's fine. I believe Hata has other plans for her and if my speculations are correct, she is being set up to be the candidate to open the path to the RG anyway. And for the least important stuff, yeah you're right you King's Jewels addicts. Everything starts with Hakuo. The path to open the RG is probably there or something like that. Huzzah for ya who care about that. Fanart Corner: Hehehe... this is going to be my new year's fanart. It's just a draft for now. I plan to sketch in the Royal Garden or somethin similar in the background. I shall call it Kimi no Ojousama lol! Go watch the movie I'm alluding to. It's simply amazing! What Alice chan went home to her home country? A-tan: Yes she was in a hurry and couldn't say goodbye to everyone. She was really sorry. A-tan: I've heard many stories from that kid about your friendship. A-tan: She told me to tellz ya that she had fun living here with ya all. A-tan: Anywayz, she was sleeping in a place like this for months, huh? A-tan: Plops down and sleeps on Alice's bed. Hina: It's not that comfortable. Hina: Ah, but wait a minute. Alice isn't around anymore. Do I still need to be in this apartment? A-tan: For example, if you were alone at night and caught a cold. 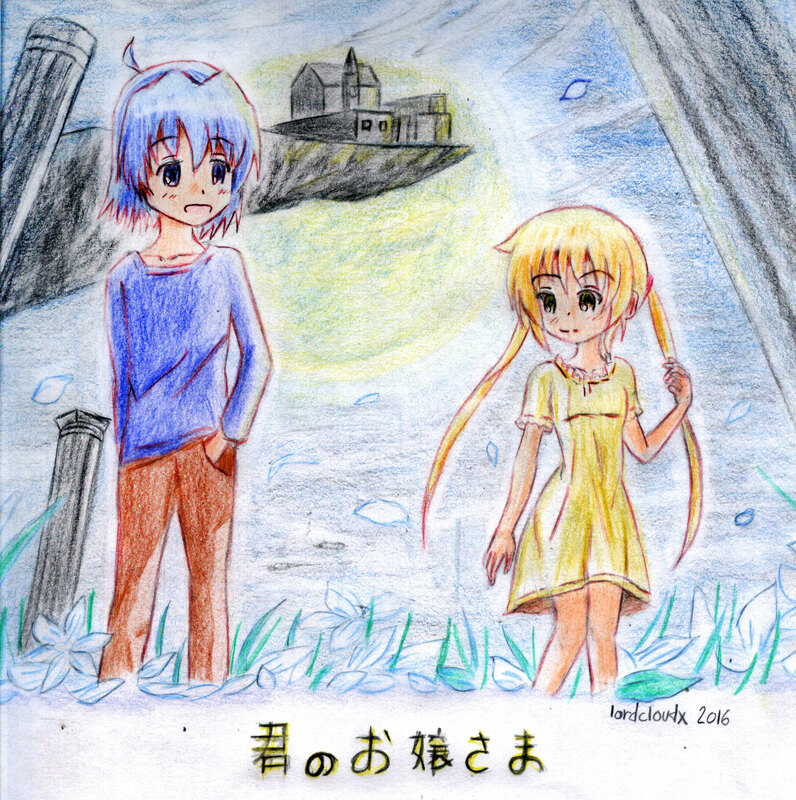 A-tan: If Hayate was taking care of you, I wouldn't enter. Hina: W-wait! WTF ARE YA SAYIN? A-tan: If that is fine, then this matter is settled. A-tan: We'll I believe that just by living together here. A-tan: Hayate will never notice your love for him. Hina: Wait, I ... such a thing is. A-tan: Of course, I have heard about it. A-tan: My former boyfriend is rather mindless, isn't he? Hayate: A-tan have you finished preparing? A-tan: Sorry, I'm rather blunt with words. A-tan: However, I really envy the lot of you. A-tan: When you lose something, there are things that you cannot regain. Hamster: Ah, HIna... who is this Tennousu san? Hina: They cherished each other for sure. A-tan stares sentimentally at the violet mansion. A-tan: Well? What did you want from me? Ayumu: I heard from Hina that you were Hayate's lover. Ayumu: Could it be that there was an incompatibility? A-tan: I wanted it to go on forever, those blissful days. A-tan: If I could do it over again, I'd like to redo that encounter. A-tan: Was our meeting really so wrong? Hamster: If you believe that much, then why are you saying goodbye? A-tan: When I looked into those eyes, I understood. A-tan: In those eyes of sorrow, I saw many reflections of myself. A-tan: I understood what it was to love. 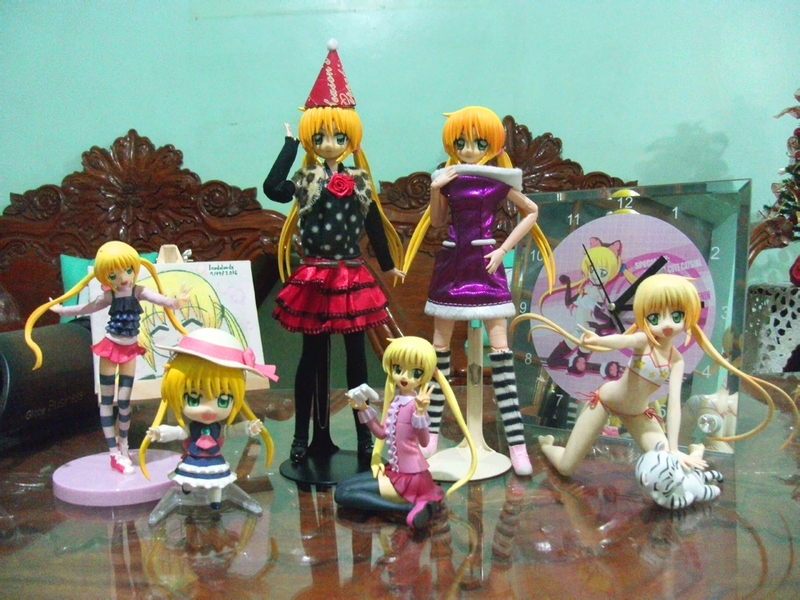 A-tan: You really love Hayate, don't you? Hamster: Since the day we met, definitely, definitely, I've been thinking of Hayate! more than Nagi-chan, more than, Hina, even longer... than you. A-tan: I know... I've been watching. A-tan: Someday, when we're all adults. I want to be friends with you all. A-tan: When that time comes, would you like Hayate to be here as well? A-tan: I'm sure, the love story will be quite exciting. It's Nagi's special day today, so don't forget to send her your greetings! You can tweet Hata-sensei (the mangaka) @hatakenjiro. Let him know that Nagi will never be forgotten! 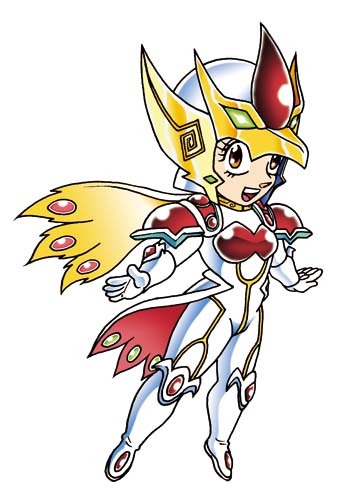 She will live on in our hearts long after the manga has concluded! Here are a few birthday images I made together with several previously unpublished fanart. Happy Birthday my kawaii waifu! It was a joy watching your slow transformation -- especially the growth of your pure love for Hayate. You are beautiful inside and out -- even if not all of us can appreciate your beauty. Still waiting for Orca Toys to release Cat Nagi this coming January -- hopefully! Try a slice of this cake, Nagi-chan! I baked it myself! I proudly proclaim my love for my waifu to the world! 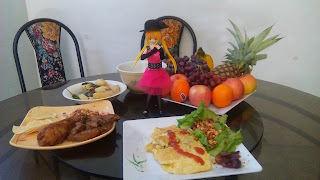 Caption after 12/03: You look more like an adult today, ojou-sama!